The Remnant Newspaper - Merry Christmas: What Does It Mean that THIS Remnant TV Video is Going Viral? Merry Christmas: What Does It Mean that THIS Remnant TV Video is Going Viral? On this Christmas Eve in the year of Our Lord 2017, I would like to wish Remnant friends and allies all around the world a happy and holy Christmas. I’d also like to share a little good news that is happening over at Remnant TV (RTV) that’s bound to help spread some Christmas cheer. Those familiar with our work at RTV will know that we’ve been at it only for a few years and that, for the most part, it’s a labor of love serving a small niche market. Fifty thousand views on YouTube, for example, is a very successful RTV program. We don’t have any cute kittens and we’re a little short on Justin Bieber interviews-- so viral videos for us are neither anticipated nor particularly sought after. Now, granted, that was a pretty big deal to start with, and it stars the leader of the free world. So, yeah, people are going to watch it. Right? Well, not quite, at least not at RTV! Lots of big news outfits posted Trump’s Christmas speech. It’s all over the web; so if anything, RTV’s version of it should have been swallowed up and ignored completely. But at the moment, this little RTV video is rather out in front. Why? It can only be because in our video we made a special point to draw attention to the most important aspect of Trump’s speech—his reference to Jesus Christ as "Our Lord and Savior Jesus Christ". The very title of the RTV vid is: “MERRY CHRISTMAS! Trump Praises ‘Our Lord and Savior Jesus Christ’." You get it? OUR Lord and Savior. The President used the first person plural. But there’s more. As this RTV video closes in on a half-million views, it has garnered 17,000 likes, but only 400 dislikes—again, we’re only looking at the YouTube numbers, though the video is doing well on other platforms. Perhaps even more significant—at the moment there are well over 3,000 comments from YouTubers (not necessarily Traditional Catholics, of course), the vast majority of which are overwhelmingly positive where the President’s pro-Christ, pro-family remarks are concerned. So, what’s going on? Is this just an algorithm fluke that means nothing? Or is it a little sampling or informal poll from which we can glean something a bit more telling. What we’re principally interested in here is the reaction to Trump’s words in praise of ‘Our Lord and Savior Jesus Christ’, which seems pregnant with implications. That’s the story. Prevailing politically wisdom these days has it that such Christocentric words from a politician would constitute political suicide—at least in the reality CNN creates for its listeners every night. And yet Trump went ahead and said them anyway, along with truly fulsome praise for the impact the Life of Christ has had on history and humanity. Why? How could words in praise of Jesus Christ suddenly be considered politically expedient, if in fact that’s all they were---words? If a very small Internet TV channel such as RTV is suddenly overwhelmed with positive responses to RTV’s praise of President Trump for uttering these words, what might that say about the country as a whole, and indeed folks all around the world who’ve weighed in on this? How many millions of Christians in the real world can we presume are fed up with the Christophobes and their hatred of Christ? How many are sick and tired of Christianity being maligned and pilloried day after day, night after night by Christophobic talking heads and ruthlessly secular politicians? I have a sneaking suspicion the answer may come as a surprise to many. There are more of us out here than even many of us realize, but Trump seems to be onto it. The media (entertainment industry) politicians have dedicated themselves to making Christians feel outnumbered and alone, so much so that resistance indeed begins to seem futile. But is it? What if it’s all an illusion, and Trump is just politically savvy enough to know that Christians—the silent majority of voters in America—are more politically powerful than they know, even here in 2017? Sitting in their homes, thinking their thoughts, how many untold millions rejoiced to hear Jesus Christ unconditionally praised by the “leader of the free world” this Christmas! And this silent majority is not made up of fools—they’re not at all sure what to make of President Trump, who he is, or how much of this he actually means in his heart---but, you know what? That’s not as important to them as the fact that he said it. To them, to us—what is most important is that, finally! Somebody in power actually said it. Somebody sided with them. And maybe—just maybe—he’s awakening a sleeping Christian giant. Politicians typically do not say things they don’t mean—unless, of course, it is politically expedient to do so. Are we to conclude that it is now becoming politically expedient to praise Jesus Christ as “Our Lord and Savior of the World”? If not, why did he say it? Trump either truly means the words he spoke on some level or, if he’s being merely political, then at least he knows that millions of Americans needed to hear those words and that those words may well help get him elected to a second term. Either way, Christians are quite right to sit up and take note. Either way, Christ was acknowledged, finally, as the ‘Lord and Savior’ He truly is—and the world heard it loud and clear. Either way, the Christophobes saw red at the President’s words this Christmas, and I’m not referring to the traditional Christmas color. The take away for us? This is far from over. There are many millions of descent people who still recognize Christ as King, or at least Lord and Savior. The perception of worldwide apostasy may still be far greater than the actual apostasy. And all of this should help Traditional Catholics the world over become fired up and ready to fight harder than ever. If the Catholic Church of Vatican II would just go back to being Catholic again, the world may be far more receptive to Christ than we’ve been led to believe it would be. And if the Pope would stop backpedaling on all thing Catholic and instead become unapologetically Catholic again and call the lost and drifting world back to Christ and His one, true Church—who knows what the future would bring. In any case, friends, let us not be discouraged this Christmas. The enemy we face is not invincible, even after having spent trillions of dollars in a century-long war against Christ and those who follow Him. And just when it seemed they were to cross the finish line, the leader of the most powerful country on earth—for whatever reason! —decided it was time to proclaim Jesus Christ “Our Lord and Savior.” This may well say more about the regular folks who voted against the overtly Christophobic opposition than it does about the man who said it. 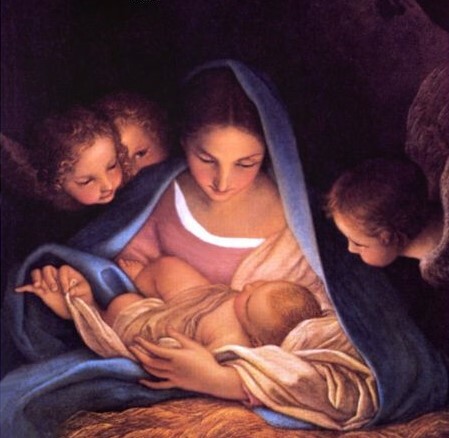 Nevertheless, may God bless and keep the man who said it, and may the Christ Child inspire him to come closer to the crib in Bethlehem this Christmas than ever before in his life. Stranger things have happened, and with God nothing is impossible. Is this a massive victory? Please! No, decidedly not. We’ve got a long way to go before the Kingship of Christ will be proclaimed in the swamp. But men and women of faith the world over know that God will not be mocked forever, and that someday soon the Christophobes’ stranglehold on the world is going to be broken by the hand of Christ. It’s just a question of when. And this may well be a little sign to help us stay alert, pray, keep the Faith and never be so discouraged by the raw power of the Anti-Christians as to conclude that there is no hope for the Christians, no reason to go on, no point in continuing the fight. We can never let that happen! In the end we know the enemy will be vanquished. We know that the Immaculate Heart of Mary will triumph. We know that the Child Whose birth the world celebrates this week will be with us always, even unto the consummation of the world. So be of good cheer this Christmas. Let’s resolve to keep Christmas merry, happy and hopeful. We have been given the greatest gift ever known to man—the gift of Faith. And even after all these years of Christophobic assault, the Child of Bethlehem still rises above it all, unscathed. He is still Emmanuel, still God with us, and Herod’s soldiers—now as in history—have failed to extinguish the lumen Christi even in this new dark age. All glory and honor to Him! So Merry Christmas, dear friends, and God bless us everyone. Keep the old Faith.